In the past I have spoken positively about Dead Gentleman Productions and their excellent fan-made, low-budget Gamers movies. Fans have waiting for a third movie in the series for some five years now. Rather than continue to slowly accrue the budget necessary to make a third film, Dead Gentleman have gone directly to the fans through a Kickstarter campaign. 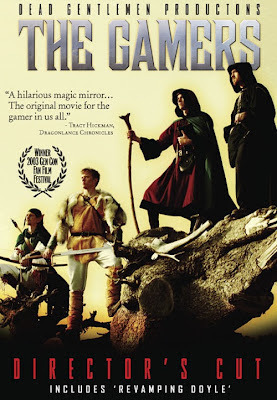 The Gamers: Hands of Fate picks up several years after the events of Dorkness Rising. The same cast of characters returns, this time determined to master a new game (a collectible card game) and overcome some more personal issues whilst continuing their roleplaying campaign (and attempting to finally destroy their arch-nemesis, the Shadow). Part of the movie will be filmed at GenCon 2012, the largest roleplaying and CCG convention in the world. The first two Gamers films are probably the best and most accurate representations of roleplaying put to film. They certainly knock the official D&D movies into a cocked hat, and are extremely funny on their own terms (the undead roast chicken and the wall of bard corpses both have to be seen to be believed). Contributing to this project or spreading the word can only be a good thing. Note: for those unfamiliar with the Kickstarter concept, people pledge to support the project through a monetary sum. However, no money is collected until the project passes its target. If it does not make it, the project fails and no money is collected. With Kickstarter projects it is important to check the previous form of the company proposing the project to assess their integrity. In this case, Dead Gentleman Productions has been in operation for fourteen years, producing numerous fan films and webisodes, and has a large number of fans. They have a detailed plan on the Kickstarter page for how the film will be funded and how investors will be rewarded depending on the amount pledged. Seeing these movies was such a revelation for me! It brought back so many memories of my gaming days in the 1980s! It reassured me that my campaign and my players were no more dysfunctional than any other group. Best of luck to them.